Your skin reflects the internal state of your body so if you look good it usually is when you are feeing healthy. If your skin has a healthy glow this means that you have good blood circulation not only through your body but just within the skin. Secondly an even more effective approach to prevent wrinkles is to increase the levels of good eicosanoids because of their powerful anti-inflammatory effects . These will do more to improve skin quality than what you put onto your skin because they are powerful vasodilators that increase oxygen levels to the skin as well as being anti-inflammatory agents. With improved blood flow there will be an improved turnover of skin cells. The best way to increase good eicosanoids is to take high quality Omega Oils. 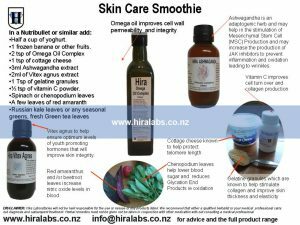 We will be introducing our Green Smoothie Recipe that will help improve skin integrity, has been modified especially to address the internal systemic factors that affect your skin. Improving blood supply to the skin through adding herbs like ashwagandha and gingko. Stimulate the production of Mesenchymal Stem Cells (MSCs) which leads to fresh younger looking skin. Increasing the production of collagen through supplementing using an oil soluble vitamin C and gelatine. Preventing systemic inflammation which causes oxidation and free radical damage. Adding Devils claw, yarrow or white willow bark extract will help with this. Preventing pre-oxidation of oils ingested and maintaining a healthy lipid layer around each cell which keeps skin looking younger. Injury or damage to tissues which produces inflammatory cytokines that form new cells. Your skin is your largest absorptive organ so only put on it what you would eat. There are vitamins, oil soluble and water soluble, -and natural products that can be absorbed by the skin. Our skin ages is due to the way we treat it topically and internally. Our stringently monitored processes ensure that there is minimal decomposition of phyto-nutrients and we use only the best costly oils.Our skin care products are made in short product runs so freshness is ensured therefore minimal oxidation occurs. Only pesticide free natural cold pressed or expeller pressed oils used. No fillers or water to increase volumes. Bottled in glass to preserve product integrity. 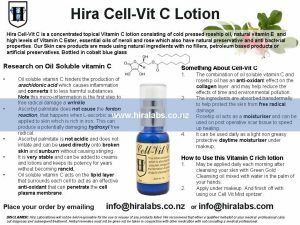 Hira Cellvit-C Lotion, a concentrated Vitamin C lotion in a 30ml blue glass bottle and gold pump top. The essential oils have natural preservative and anti bacterial properties. Helps prevent the formation of wrinkles. Acts as a powerful topical anti-oxidant. There are two main types of vitamin C.
Water soluble vitamin C or L- ascorbic acid, which gains entry to the inside of the cell, cannot prevent free radical damage on the cell wall. It is also quite acidic and irritating breaking down within a day. Oil-soluble vitamin C or vitamin C ester, which acts on the lipid layer that surrounds each cell. It acts as an effective anti-oxidant that can penetrate the cell plasma membrane. Research shows that the absorption of this vitamin C, when measured by scientists at Proctor and Gamble, is absorbed much more quickly and achieves levels ten times higher than L-ascorbic acid. It is not acidic and does not irritate the skin like L-ascorbic acid and can be used directly onto broken skin and sunburn without causing stinging. It is very stable and can be added to creams and lotions and keeps its potency for years without becoming rancid. This rich hydrating cream consists of a range of oil vitamins C and E, palmitic acid, and vitamins A,E,F,H (biotin) B8(inositol), Hypericum, calendula, aloe vera natural plant humectants and AHA’s anti-oxidants, lecithin, and phyto nutrients in a base of rosehip and jojoba oils and bees wax. 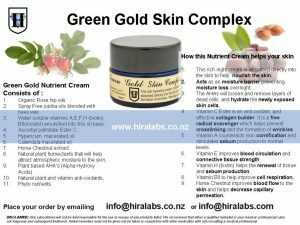 The cream is absorbed directly into the skin to stimulate collagen production, enhance cell turnover, and prevent the formation of wrinkles. It contains concentrated levels of Oil-soluble vitamin C or vitamin C ester, which acts on the lipid layer that surrounds each cell. It acts as an effective anti-oxidant that can penetrate the cell plasma membrane. Massage gently into skin after cleansing at night. Over the moon with the Green Gold! What an amazing product. Skin food luxury. Better than any imported product I have ever tried, ever. Thank you! I’d like to order some Green Gold cream at the old 35% discount offer from before. That’s $38.67 ok? I was blown away by the improvement in my skin. I should have done before and after photo’s as a quite large keratosis has almost entirely disappeared! A multivitamin herbal complex consisting of vitamins A, E, F, H (biotin) B8 (inositol), horse chestnut extract and natural plant humectants and AHA’s. Biochemical and clinical observations show that a synergistic effect is achieved by a combination of various vitamins and herbs improving overall effectiveness. 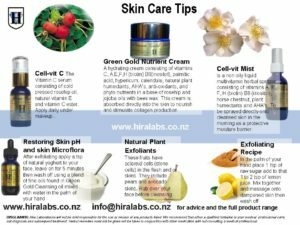 Hira Cellvit Mist , a concentrated vitamin rich liquid in a 30ml cobalt blue glass bottle with a spray pump top. This non-oily liquid may be sprayed directly onto cleansed skin in the morning as a moisture and vitamin base under makeup. Sprayed onto the face during the day to freshen and moisturise the skin exposed to the dry environment of an air-conditioned office or during air travel. It is an ideal freshener and moisturiser that can be applied during vigorous outdoor exercise, or for use at horse events over your makeup etc. May be sprayed onto cleansed face at night to ‘feed’ the skin, followed by Hira Cellvit-C. Particularly suitable for teenage skins to balance sebum production. May be used as an all over moisture mist for scaly dry skin on arms and legs. Used as an after shave skin conditioner for men. You may notice that after application the skin will have a slightly moist feel. This is the anti-oxidant moisture barrier. Is intended for application on skin with under or over active sebaceous glands. Vitamin A counteracts skin cornification stimulates sebum gland secretion without increasing it above normal. Vitamin E improves circulation of blood which improves connective tissue strength. Vitamin F ( complex of essential fatty acids) helps rehydrate scaly dry skin. Vitamin H(biotin) is necessary for the renewal of tissue and for the correct composition of the sebaceous gland. Vitamin B8 important for cell respiration. Provides a moisture barrier and to skins poorly supplied with blood. I absolutely adore these two products and my face skin is so revitalised now, elastic and glowing. You are very clever, the smell and presentation is lovely too. Thank you very much. the epidermal layers of the skin. The principle of like dissolving like enables to oil to not only lift away dirt and makeup but also any skin oils and oily residues from makeup. To get a superbly clean and soft silky skin that has dead skin cells sloughed off firstly put a few drops of lemon juice on he palm of your hand, add 1/2 tsp of raw sugar (natural glycolic acid) and gently massage onto your face. Rinse off with cool water then cleanse off by adding a few drops of Green Gold Cleansing oil to the palm of your hand along with a few drops of water. Massage well into the skin with a circular motion. This will also remove mascara and eyeliner without leaving an oily residue. Wipe off with a tissue. DISCLAIMER: Hira Laboratories will not be held responsible for the use or misuse of any products listed. We recommend that either a qualified herbalist or your medical professional carry out diagnosis and subsequent treatment. Herbal remedies must not be given not be taken in conjunction with other medication with out consulting a medical professional.